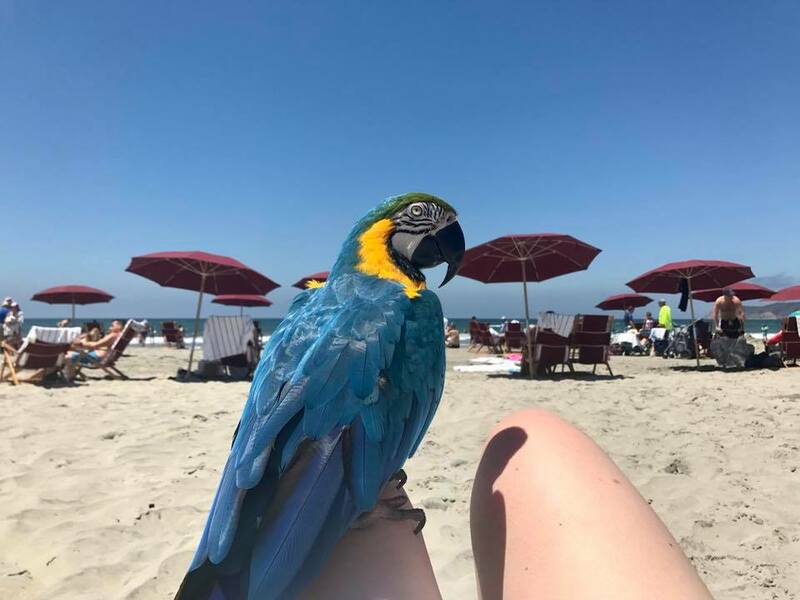 It is important that parrots are exposed to several hours of natural sunlight each day to receive Vitamin D for their feathers, bones and beak. They are also flock birds, which means that they are hard wired to be with others, communicating and interacting, at all times. Sometimes that is difficult, which is why it is important use outdoor play as a form of enrichment, even if the destination is ordinary. Macaws are very visual. They enjoy places that are beautiful like gardens, beaches, tropical settings and fancy hotels. Taking them to beautiful settings and allowing them to interact with others is a form of enrichment. CLIP WING FEATHERS – it’s like a haircut. Do not clip growing feathers, they contain a vein & nerve that recede once the feather has matured. A correct clip prevents the bird from ascending and allows them to glide down to safety. Give your bird a sense of safety with you at all times. Wear a loose top, like a t-shirt or sweatshirt, that you can put your bird inside and hold close to you until it is safe. Bring hand sanitizer, wet wipes and a towel to clean feet and perches. Bookmark the safe & toxic plant list in your phone. If going to the beach, bring a towel, chair and shade source. Pay attention to who and what is around you. Pay attention to your bird, who can see almost 360 degrees and has a keen sense of sound. Know your bird’s fears and apprehensions about people, places and things. Know if dogs are allowed. Is it a restaurant or a beach? In a restaurant, dogs are generally well behaved. Is it a sidewalk cafe, where dogs not dining may be walking by? Where is your bird perched? Are you paying attention? On a beach, they are usually off-leash. Understand that if there is a predator in the area, birds have a universal alarm call. If the birds in the area take flight at once, out of instinct, she will attempt to join them. Listen and watch the wild birds. Pay attention to elevation, breezes and updrafts, especially near the ocean. Macaws are extremely aerodynamic, flying several hundred miles per day above rain forest trees in the wild. 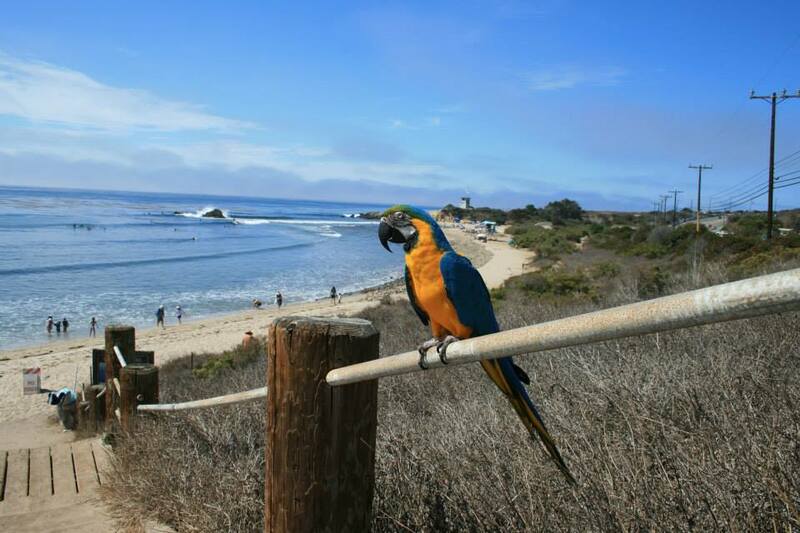 Even with a wing clip, a strong updraft and the desire to flee danger can enable a clipped macaw to glide over streets, freeways and out to sea. Are there any toxic plants within her reach? This is an issue especially at restaurants with outdoor seating. This should go without saying… if going to the beach, avoid rotting kelp and dead animals. In this photo, she is about 10 feet away from the kelp. If someone is walking behind you, let them pass so that they don’t scare your bird into flight. If you are in a crowded public place, be aware of who and what is around you and listen to your bird. You won’t be able to see everything, but he or she can. If you hear crows or hawks, or are at an elevation where there is an updraft, bring your bird down off your shoulder and onto your lower arm or hand so that you can hold her feet. If you see crows gathering or following you, seek shelter under a tree or in a building until they loose interest. If you see a large dog on a leash that you don’t know, stand aside and let it pass. In our case, Claire likes big dogs because she grew up around them. So I have to be cautious despite her comfort. Although, if she sees a dog running she will let me know. If it is windy a bluff or cliff near the ocean, stay away. If it’s a palace on a cliff, stay away from the rail. Always have an emergency plan when you perch your bird. If you can’t see a way to gain control over a situation should it arise, choose another perch. Roll all car windows up to 2″-3″ opening before driving with your bird on your shoulder. Check before pulling out from drive-thru facilities. This perch is on a rail on a gradual elevation. There is no wind and barely any breeze. As you can see, the ocean waves are nearly flat. On a windy day, this would be unacceptable. The danger would increase if this were the railing on a cliff or mountain side with a steep drop, where she could fall forward and be carried by the wind. Hold feet – If you are standing on a bluff, secure your bird’s feet. Sit down – the quickest way to gain control over a situation, is to sit down, lean back and secure your bird as he or she moves forward. At this point you can wrap a baby blanket or large scarf around him or her. Stand up – if there is a dog or child endangering your bird, stand up with your bird to move him or her out of reach. Catch – If he or she tries to lift off from your shoulder, place one hand on her breast and the other behind her wing toward her back, then guide your bird toward your chest as the wings are flapping. From there you can secure or conceal her. Choose perches wisely – don’t perch your bird on a rail at an elevation. Protect from germs – carry hand sanitizer, wet wipes and a towel to place over makeshift perches in public places, like chairs and benches, when needed. Move her away from toxic plants. Try to distract her from chewing the decor, such as non-toxic plants, mini-blinds and window molding. 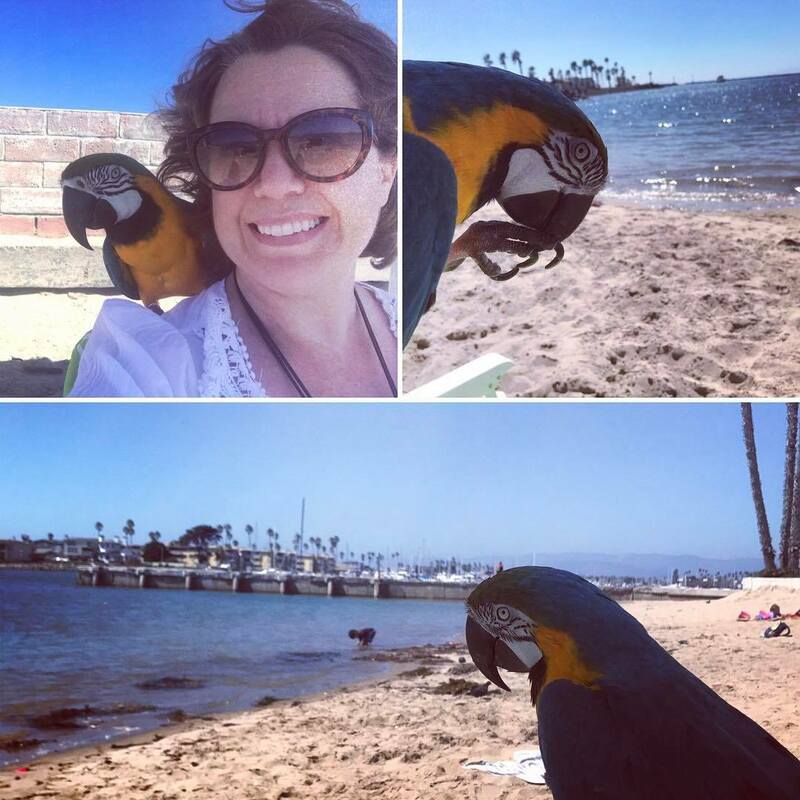 If going to the beach, keep your bird out of the sand. Lay down a towel and allow your bird to perch on your chair or your self. 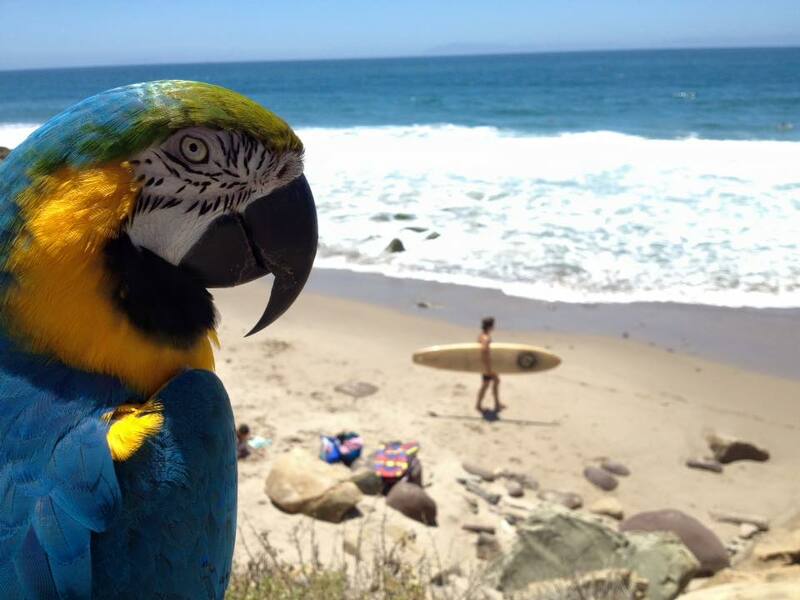 Sand is like grit, which is dangerous to macaws. It can become trapped in their crop, causing physical damage. Macaws grind their food with their beaks, they do not use grit. Another reason to keep your bird out of the sand is that they like to forage, meaning that they dig through things with their beaks to explore and find food. What they find in the sand can be a health hazard. Keep them elevated.